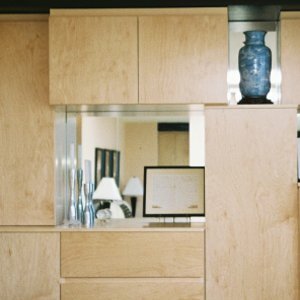 Janet Stevenson, Closets and Cabinetry By Closet City, Montgomeryville, PA, created a “Personal Boutique” for her client. Boutique-style storage space created from converted spare bedrooms was the theme for two projects that tied for the 2015 Closets Top Shelf Design Overall Winner award. 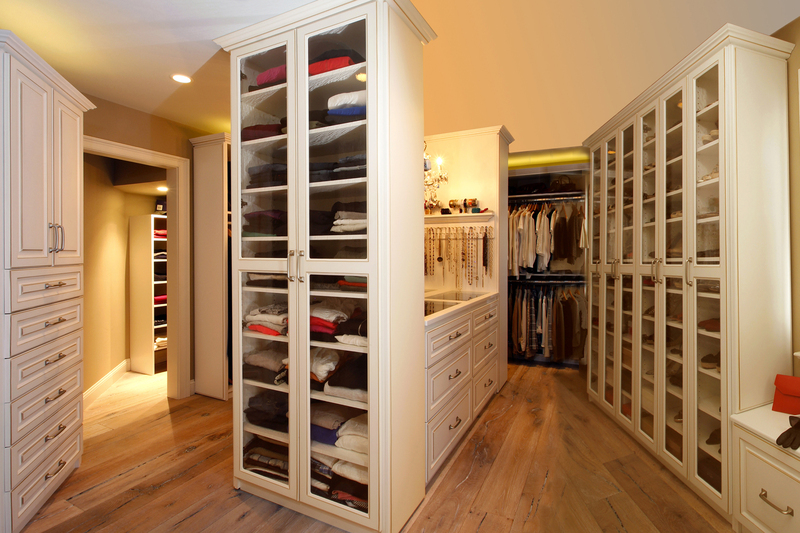 Both closets feature unique touches that add a bit of glamor to the traditional custom home organization systems. Janet Stevenson, Closets and Cabinetry By Closet City, located in Montgomeryville, PA, took an unused bedroom situated just off the master bedroom to create a “Personal Boutique” for her client. Stevenson took those requests, while also being mindful of the major kitchen renovation that was being done simultaneously, and created a space rivaling the trendiest clothing and jewelry store. “The whole dressing room was finished with glazed crown moulding, and we kept the units 6 inches away from the ceiling and installed mood lighting above — except for the tall end cabinets that flanked the drawer portion of the island,” Stevenson adds. The island takes center stage and features glass door cabinets for sweater storage. The top is composed of four glass panels allowing the client to see directly into the four double pullout jewelry drawers. “We also created a beautiful dressing table with pullout accessory drawers for her make-up and hair grooming products, and had the Hollywood lights installed around her mirror to give her that glamorous look she desired,” Stevenson adds. Angel and DeVoe Martin, Affordable Closets Plus, designed this incredibly elegant space with many hidden touches including a hidden bar in the banquette seating are of an 8-foot island. Angel and DeVoe Martin, owners of Bangor, PA-based Affordable Closets Plus, took a large bedroom that had a fireplace with a marble mantel and incorporated it into their winning “Formal Dressing Room” design. Features of this luxuriously, elegant lounge include an 8-foot island with banquette curved seating and custom upholstery on one side. The seating area also has a hidden pull-out bar. 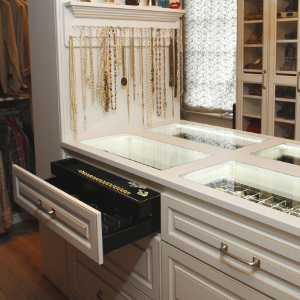 The other side of the island features nine drawers and one large oversized jewelry drawer with a glass top. There are four 12-foot high wardrobe cabinets with custom pilasters that serve as hidden storage for accessories, the Martins say. Another thoughtful touch is a motorized pull-down rod for double hang space in the cabinets and heavy crown moulding with decorative carved ornaments and LED accents. “To add a spectacular sparkle to this elegant dressing lounge, our faux finisher added a beautiful silver leaf pattern inspired by “Pietre Dure” design to give the look of hard stone inlay,” the couple says. “Then the 10-foot by 12-foot space was embellished with 100 Swarovski crystals.” See the bling-bling for yourself as DeVoe Martin shows off the project’s glam features in this brief video.